If as a horse owner, you have come upon a temporary situation in which you would like to keep your horse, but need assistance in the interim, we have provided a listing of Safety Net Programs and other Resources to help you get back up on your feet. These programs can help temporarily in the form of hay and food, veterinary assistance, gelding clinics, and more. I CAN NO LONGER KEEP MY HORSE, WHAT ARE MY OPTIONS? owners may be forced to make the decision to find other available options for their horse. *If you find yourself in a situation, in which you want to keep your horse, but need temporary assistance until you can get back on your feet physically or financially, there are various safety net programs available to help. Please see above on this page. It is important to note, that not all horses at-risk or in transition have suffered from neglect and abuse. A child may have outgrown his or her pony or loved on to different interests and the parent now has to contend with the monthly care and expenses of a large animal in the backyard or at a boarding facility. Another scenario is the horse that has been a great working animal throughout the years but is getting older and can no longer perform up to the standards that the rider needs, but may be suitable for another career. It is incredibly common for these reasons, that horses change hands frequently throughout their lives. Most horse owners feel some moral obligation to make sure the horse they are selling or donating ends up receiving proper care and treatment. Legally, as a seller, you must share anything important you know about the horse’s behavior and physical condition. If the horse is healthy and of a reasonable age, it is always best to find suitable new ownership rather than have to euthanize the horse. On the other hand, if the horse is old and not in good health, then the most humane decision may indeed be euthanasia. every horse is suitable for every job. The below links will help owners in decided which is the best option for their horse. Selling your horse to another person enables you to meet and perhaps develop a relationship with the buyer. There are many ways to advertise your horse for sale, including classified ads in your local paper, horse magazines, websites, feed and tack stores, shows or rides in your area, or by directly contacting other horse owners and letting them know you’re marketing your horse for sale. Prices and conditions vary by sale and by region, so be aware of standards in your area. Also, in a private sale, you might have the option of putting a buy-back agreement into the sale. So if the new owner decides to sell the horse, you’ll have an opportunity to buy the horse. Please remember to disclose any health problems, limitations or vices that your horse might have when selling him. have “reserves” or minimum bids that must be paid for the sale to be completed. Indeed, at many the seller can speak to the auction company and set a price below which the horse would not be sold; it would be returned to the seller. Other sales do not have such minimums and the horse is sold regardless of the bid price. In some of these sales, dealers are purchasing horses to take to facilities that will process the horses for meat to be shipped overseas for human consumption. Selling a horse for such purposes is a decision for the owner to make. But all owners should be aware of this possibility when they send their horses to auction. An increasingly popular form of horse “ownership” is leasing. Provided the horse is sound with a good disposition, many people are interested in owning horses that would prefer this try-before-you-buy option. It provides an opportunity for potential owners to see how a horse would fit into their lives. As leasing grows in popularity, so do the forms of lease payments. You can loan the horse in exchange for boarding and daily care, or you can create another lease deal with the lessee. A retirement facility can be compared to an assisted living facility for people. The staff is trained in caring for the health issues facing older horses and those with injuries. More often than not, retirement facilities house horses that are no longer used for riding and working. Not only elderly horses but horses that have ailments but are still comfortable to walk and graze. Their daily routines should include lots of turnout with buddies and good, quality attention. Of importance, a good retirement facility should have plenty of pasture. 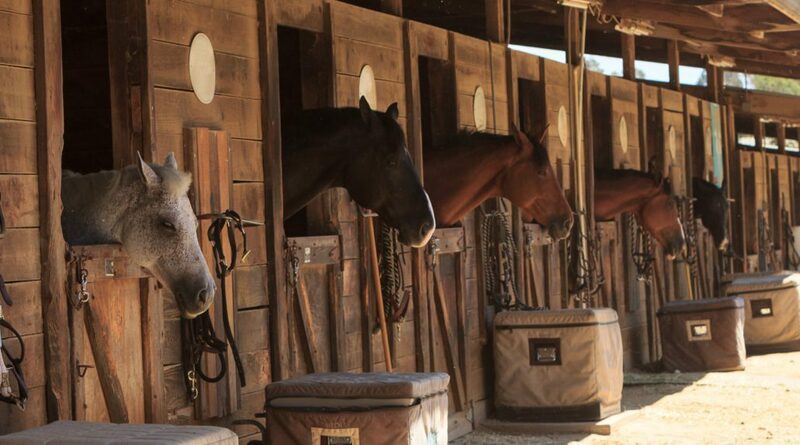 A key issue with elderly horses is that they need room to move around to combat arthritis — horses standing in box stalls will stiffen up quickly. Another thing to take note of is if specialized care is offered – such as custom feed, special medical attention, and an educated staff that understands the needs of your horse. Retirement facilities are not free for the most part. The owner pays a monthly board bill just as you would at any boarding facility. There are retirement facilities in which you can donate your horse, but you would no longer own him or control what happens to him. Most of these are for specific breeds. In some cases, horses must be at least pasture sound — some may go on to second careers, while most spend the rest of their days eating grass. Unsound or “pasture pet” horses are only accepted for retirement at some facilities with a yearly tax-deductible donation for the on-going care of the horse. Surrendering your horse to a rescue or sanctuary should be considered as a last resort. Oftentimes Rescues have a limited amount of space and resources to take in a new horse. It is best to reserve those available spaces for horses who are truly at risk for abuse or neglect. Numerous facilities play a role in providing care for or finding new owners or careers for horses that are considered at-risk or in transition, or have been subjected to neglect or abuse. Although the UHC does not endorse one particular facility, it supports the Care Guidelines for Equine Rescue and Retirement Facilities, developed by the American Association of Equine Practitioners (AAEP). If you’ve decided to find a Rescue or Sanctuary for your horse, we strongly encourage you to read these guidelines and ensure the facility you’re considering operates by them. While the vast majority of Rescues and Sanctuaries are run honestly and with the horses’ best interests at heart, there have been reports of horses abused and neglected at a handful of facilities. The AAEP guidelines were intended for rescue and retirement facilities, but any facility that accepts horses should adhere to the basics. Therapeutic riding centers are found in cities and towns across the nation. These centers provide a variety of equine activities to people with physical, emotional and learning disabilities. For individuals with special needs, equine-assisted activities have been shown to improve muscle tone, balance, posture, coordination, motor development, as well as emotional well-being. The North American Riding for the Handicapped Association (NARHA), a national non-profit organization, accredits many of these riding centers and certifies their instructors. Horses are valued partners in the human–equine relationship that is therapeutic riding. Because the horses must interact with individuals who often have profound disabilities, these riding centers are highly selective when accepting horses into a program. Many of these horses are donated, volunteered or leased by horse owners in the community. The breed of a horse is not a critical consideration — different breeds offer different builds needed for a wide range of activities, including riding, driving, vaulting, and interaction on the ground — the most important aspect is the individual horse’s suitability for equine-assisted activities and therapy. While minor health issues may be acceptable, horses used for therapeutic riding programs must be sound enough to work regularly. To the casual observer, walking in an arena with a disabled person looks like an easy task for a horse, but it is not. The horse must be physically able to carry a person whose weight may be unevenly distributed. In addition, the horse must also be able to deal with situations such as quietly walking up to a ramp with a person in a wheelchair and standing perfectly still while the person is being assisted in mounting the horse. Many programs require the horses to go through a trial period at the center before they are accepted. Only a select number of horses meet the strict qualifications set forth by these riding centers. You can find a NARHA-affiliated therapeutic riding center near you on their website, www.narha.org. Many colleges, universities and private schools across the country have equine programs and accept donations of horses. These horses may be used for a riding program, breeding program, or needs associated with the curriculum of a pre-vet or veterinary degree. Schools with an animal science department that includes an equine research component or a veterinary school may accept your horse to be used in teaching/research to benefit medical advancements in the equine field. Once the property of a university, you will (generally) not be able to place restrictions on the use of that horse. It is certainly acceptable to inquire about the type of research undertaken by that particular school. Academic programs have varying requirements for the horses that are accepted as donations. In some cases the school may lease the horse for a certain period of time. As in any other legal agreement, be aware of all the legal details and potential liabilities associated with a lease. Potential donations to be used in the riding programs are often evaluated using stringent criteria as far as soundness, disposition, amount of training and age. Institutions that have very strict donation requirements generally want the horse for the long-term. Schools that accept any and all donations tend to have a high turnover rate of horses within their program. school’s program may be an ideal candidate for another. Many people assume that when a horse is donated to an educational institution, it will spend the rest of its life there. Once a horse is donated it becomes the property of the institution and may be sold immediately or at a later date to raise additional funds for that program. Do your homework! Before donating your horse to any organization, make sure you understand, and are comfortable with, their policy on selling horses. The most important thing you can do is research the organization so that an informed decision is made about your horse’s future. The mounted unit pursues a fourfold mission that consists of traffic control, crowd control, community relations, and prevention of street crime. Public relations is a mounted unit forte. Seldom is public attention so magnetically drawn to police as it is to an officer on horseback. The expertise of mounted unit officers in crowd control is also renowned. Officers are used extensively at concerts, demonstrations, strikes, entertainment events, public celebrations, and the numerous assemblages that take place throughout the year. It has been estimated that one mounted officer on horseback has the effect of 10 officers on foot, depending on the demeanor of the crowd. The mounted unit has therefore earned the reputation for being in the vanguard whenever the police department is called upon to ensure the order and safety of large throngs of people. Some retired horses spend their days in the prison system. Not only does your horse benefit from the care but the inmates benefit as well. Many inmates have never been around large animals and building a bond with an animal helps teach them empathy and compassion. It’s a great learning experience for the inmates to see and treat the ailments that come with horses that have been around the block, and each horse gets that special attention it might need. For many horses it’s their last option, as many non-profit retirement facilities don’t have the staff to treat lots of special needs cases, so it can be viewed as a hospice situation for the horses. Finding a new home for a horse is not always an easy job and various equine facilities play a role in providing care or finding new owners for horses. Whether an owner is searching for the perfect retirement farm, looking to find their horse a new job in therapeutic riding or in the mounted patrol, or if they are in need of placement with a rescue or sanctuary, there are questions every owner should ask before giving up care and control of their horse. Does the facility subscribe to accepted guidelines for operating such facilities, such as the “Care Guidelines for Rescue and Retirement Facilities” prepared by the American Association of Equine Practitioners? Is it an entity exempt from federal tax under Section 501(c)(3) of the Internal Revenue Code? Does it file IRS Form 990 and forms required by the state? Will the facility provide copies? Does it have a mission statement and a board of directors? Who are they? How long has the facility been operating? If it is a facility that will use the horse, how will it be used? Does the facility have ample room for horses to graze and/or move about? Will the horse stay at the facility or be placed into foster care? If the facility uses foster care, how are foster homes screened? Does it have an agreement regarding the use, boarding or care of the horse? If it is a facility that adopts horses out, what are the requirements for adoption? Does the facility follow up with the new owners to ensure the horse is being properly cared for? Does the facility have a policy against breeding or restrict the horse’s use in any way? What is the facility’s post-adoption policy on breeding and use? If this is an adoption facility, are stallions gelded upon entry and before adoption? What becomes of the horse when the adopter or the user no longer wants the horse? Will the organization advise you before your horse is transferred to a new owner? Can the original owner ask for the horse back? Will the facility provide routine and emergency veterinary and dental care and farrier needs? Does the facility provide training/re-training for the horse? What are the physical characteristics of the facility, including barns, pastures and shelters? Can owners visit if they wish? Have any welfare charges been brought against the facility? Does the facility euthanize horses that cannot be placed? If so, will the facility notify the owner beforehand? Does the facility appear to have adequate feed (hay, pasture, grain) for the number of horses on the property? What is the overall appearance of the facility? Many people are confused when it comes to the topic of rescue versus retirement regarding the subject of horse welfare. What is the difference between a rescue and a retirement facility? “Owner Initiated Surrenders” are not generally accepted unless horse is at risk. Supply and demand — they are the ingredients that form the foundation for nearly all successful business models. Markets are sound and profitable when there is a healthy balance between the two. The theory holds true for the horse market as well. Often, however, owners may not be aware of the demands that exist for horses that may be “unwanted” by some, but desired by others. The purpose of this chapter is to show some of the many programs already in place by horse breed organizations and other groups, in which horses are needed by participants. From trail riding enthusiasts to horse show exhibitors, people are searching every day for horses that fit their lifestyles and interests. By understanding the activities encouraged by breed organizations, owners of some unwanted horses might find a good fit, and a good market, among people seeking horses for organized shows and recreational events. Following is a listing of some of the most popular programs and activities underway today and some true-life stories of unwanted horses that developed into champions. Nearly all horse breed associations offer opportunities for friendly competition. Although a horse may be retired or reaching advanced years of maturity, horse shows offer outlets to help keep the horse active and involved. The registries offer several different disciplines with classes ranging from leadline to saddle seat pleasure to barrel racing. A horse owner can often find a way to keep horses involved for a long time in the variety of disciplines offered in the showing world. The majority of breed registries in the United States host local shows. More competitive riders enter their horses in national and world championship horse shows. The events are qualifying or non-qualifying, based on each association’s standards. Contact the specific association you are interested in to find out more information on how to become involved in showing and what various other programs they offer. The United States Equestrian Federation (www.usef.org) is the national governing body for horse sports in the U.S. The following organizations offer both competitive and noncompetitive options to keep your horse active. created to help deal with this situation. The Mustang Heritage Foundation is dedicated to helping increase the successful adoptions of America’s excess Mustangs and burros. The Mustang Heritage Foundation works with the BLM and other adoption-oriented programs to find quality homes for these animals. In addition the foundation has created training programs designed to involve knowledgeable horsemen and horsewomen in the gentling of Mustangs prior to adoption. The organization is also committed to creating a more marketable horse through improving selection and expanding and enhancing training programs for critical mustang age groups. can reach them at (202) 296-4031. I AM CONSIDERING EUTHANASIA FOR MY HORSE, WHAT ARE MY OPTIONS? Horse ownership undoubtedly comes with numerous responsibilities, and owners must be prepared to make good decisions regarding the health and welfare of their equines on a daily basis. One of the most difficult and emotionally draining responsibilities is determining, with the help of your veterinarian, the appropriate time to end a horse’s life. It is a good idea to have a plan in place before you, as an owner, are faced with such a decision, because often times these situations arise in the form of an emergency and a decision must be made quickly. Is the horse’s condition chronic, incurable, and resulting in unnecessary pain and suffering? Does the condition of the horse present a hopeless prognosis? Is the horse a hazard to itself or to others around it? Will the horse require continuous medications for pain relief and suffering for the rest of its life? Decide when and where the procedure will be best carried out, bearing in mind that arrangements must be made for removal of the body. Choose what is most comfortable and practical for you, your veterinarian, and your horse. If you board your horse, inform the stable manager of the situation. Be aware that, for safety reasons, your veterinarian may not allow you to be touching or holding the horse during the procedure. You will, however, be able to touch and be with your horse afterward. Make arrangements in advance for the prompt removal and disposal of the body. Check with your veterinarian and/or the city or county health department. Many municipalities have ordinances prohibiting or restricting burial. Removal to a rendering facility or pet crematory may be required. Explain to members of your family, especially children, in sensitive but honest terms, why the decision was made to euthanize the horse. Allow yourself to grieve. Finding a support person to talk with can help you work through this difficult period (see below). If the horse is insured, notify the insurance company in advance so that there are no problems with claims. While the veterinarian will provide you with any required documentation, the rest (notification, filing, follow-up, etc.) is your responsibility. To help you deal with your grief, there are local and national counseling organizations, such as the University of California, Davis, School of Veterinary Medicine’s Pet Loss Support Hotline, (530) 752-4200. Your veterinarian may also know of resources in your area that can help you, so don’t be afraid to ask. when you could not be contacted. According to the American Veterinary Medical Association, there are only three acceptable methods of euthanasia for horses: barbiturate overdose given intravenously by a veterinarian, gunshot, and penetrating captive bolt. Each method has its own advantages and disadvantages and must be considered on a case-by-case basis. barbiturate overdose is its speed of action and minimal discomfort to the horse. The major disadvantages to this method are that only a licensed veterinarian may administer the IV injection, and following euthanasia, the carcass will contain high levels of barbiturate, making it an environmental hazard. There is also a rare chance the horse will experience a reaction to the barbiturate. The cost of this type of euthanasia varies throughout the country. The proper use of a firearm causes trauma in the cerebral hemisphere and brainstem and results in a painless, immediate death. One advantage of gunshot is that there is less need for the animal to be restrained. Additionally, the carcass does not present any environmental dangers. However, this method should never be attempted by an inexperienced person. This method of euthanasia can be dangerous if performed improperly. The bullet may ricochet, for instance, and bystanders must use extreme caution during the procedure. It is also aesthetically displeasing to the owner and/or bystanders. Penetrating captive bolts are powered by gunpowder or compressed air. Similar to gunshot, it causes trauma to the cerebral hemisphere and brainstem, resulting in an instant, painless death. Additionally, the carcass is not an environmental threat. The captive bolt should only be used by skilled individuals and might not be available in all locations. This method might be extremely displeasing for an owner or bystanders to observe. Arrangements must be made for removal of the animal’s remains following death, be it from natural causes or euthanasia. If the horse dies or is euthanized at an equine hospital, the hospital can take care of this for a fee. In other cases, the owner of the deceased must make arrangements, keeping in mind that in most states, it is the legal responsibility of the attending veterinarian to ensure the carcass is properly disposed; therefore veterinarians must possess specific knowledge of their area’s regulations. If the owner does not follow local statutes, he or she may unintentionally cause legal problems for their veterinarian. First and foremost, carcass disposal must be done in a manner that does not cause harm to other animals or humans. regulations vary greatly from state to state with regard to animal species. Local agricultural extension offices are a useful resource for this type of information. There are several commonly used methods of equine carcass disposal, including burial, landfills, composting, incineration, rendering and biodigesters. Regulations on horse burial vary from state to state and within states, from locality to locality. Many jurisdictions require the burial site be no fewer than 100 yards from wells, streams, and other water sources, and in some locales, it is illegal to bury a chemically euthanized horse. Generally, a trench 7 feet wide and 9 feet deep is sufficient, with at least 3 to 4 feet of dirt covering the animal’s remains. In order to accomplish this, one needs access to a backhoe, which can be rented for a fee between $250 and $500, depending on the location. Landfills are an alternative to burial. Keep in mind that not all municipal landfills accept animal carcasses, and those that do, do not necessarily take horses. Additionally, some landfills that accept horse carcasses will not take the remains of a chemically euthanized animal. Costs can be higher, but tend to be between $80 and $150. While incineration/cremation of a horse carcass is very expensive, it is one of the most environmentally friendly solutions to body disposal. Cremating a 1,000-pound horse can cost between $600 and $2,000, depending on location and the current price of propane. The incinerators are regulated by strict environmental laws at both the federal and state level, thus providing control over air pollution. As the ashes pose no environmental threat, they may be returned to the owner and buried or may be sent to a landfill. Rendering is an effective, affordable and environmentally safe method of livestock carcass disposal. The carcasses are “cooked” to destroy pathogens and produces end products such as bone than can be used in animal feeds. Rendering companies will normally pick up the remains and charge a fee ranging between $75 and $200, again depending on location. Only 50 percent of the states have rendering plants, the majority of which are concentrated in the Midwest. Composting, a controlled, sanitary decomposition of organic materials by bacteria, has recently gained popularity. It is performed in covered trenches or piles that must be located away from runoff and drinking water supplies to avoid contamination. The combination of vegetative material and moisture results in temperatures reaching at least 130°F, which, over the course of time, kills most pathogenic viruses and bacteria. It takes approximately 9 to 10 months to compost an intact horse carcass, and the end product is a spongy, odorless substance that can be used for soil supplementation. Livestock composting is legal in every state except California, but even in states where the practice is permitted, it can be limited by carcass weight. Information on composting and its availability in your area may be obtained from your respective state’s Department of Agriculture. $0.25 per pound, as opposed to $0.75 per pound using an incinerator. permission (except in extreme cases). Most insurance providers require that they be kept informed from the start of a horse’s medical condition, especially if euthanasia is a potential outcome of the illness. In case of an emergency, it is up to the policy holder to notify the insurance provider. Some policies even require a second opinion before a horse is euthanized, but it is always up to the owner and veterinarian to decide what is best for the horse. Difficult though it may be to contemplate, there may come a time when, for humane or other reasons, you need to consider euthanasia for your horse. Choosing whether, or when, to end a beloved animal’s life may be the hardest decision you ever have to make regarding your horse’s welfare. However, it may be one of the most responsible and compassionate things we can do for our horses. It’s never an easy decision to make, but perhaps the most compassionate thing you can do for a horse that is extremely ill, severely injured, lame, or dangerous is to have your veterinarian induce its death quickly and humanely through euthanasia.